Extra pockets for the certificate binders above. 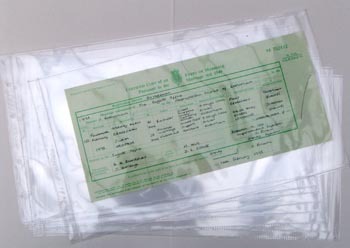 These long certificate pockets are for the tradtional long birth, marriage and death documents that many families have in their family archives. Use for safe long-term storage of certificates, family tree printouts, will copies and census printouts etc. Made from inert (acid-free), clear polypropylene these pockets do not need to be removed from the binder mechanism to insert or remove documents. These pockets also fit our A3 landscape folders. Pocket dimensions: 39.8 x 23.4cm (15½ x 9ins) approx. Material thickness: 110 micron approx. These are not A3 pockets. Click here to view A3 pockets.